This past week, a very odd story ran in many of the local papers..
FRAMINGHAM, Mass. - Police in Framingham are trying to figure out who keeps leaving chunks of meat on the town common, and why. Police say residents have been finding butcher-quality cuts of meat on the common for about five weeks. In the most recent incident, a resident discovered a large piece of raw, unwrapped meat, along with what appeared to be a liver and some bones on Tuesday. The town Board of Health is also on the case of the mystery meat. Police are asking anyone with information to give them a call at 508-872-1212. In possibly-related news, self-professed neo-shaman, Ervin Schnorkbuttle, claims to have proven the existence of a carnivorous spirit inhabiting the Framingham Town Common. Offerings of raw meat, left for the spirit at night, disappear without explanation, says Schnorkbuttle. Except this meat isn't disappearing!! More likely it is a mischievous neighbor? Now how bad can the economy be if people can afford to taunt their neighbors with butcher grade meat? It's not like they're tossing around ground chuck. So many things have been running through my head of late. I just haven't had the mental discipline, to settle on any single one, for my blog. Then this sharing, confessional mood struck and I just went with it. The following is a small peek into me myself and I.
I appreciate big beautiful supermarkets with wide isles and an extensive international food section. I love the way babies smile and laugh at everything and nothing. I gave my first kiss in 1st grade, to a very mortified classmate. And received my first kiss 9 years later. I love digging tunnels in the snow. I sometimes listen in on others conversations at restaurants. And enjoy making up ridiculous conversations when others are eavesdropping. I so enjoy silliness and quirkiness. I killed a bumble bee, stomped it with my foot when I was in 2nd grade and it still haunts me. I believe there are times when emotion should outweigh reason. I wonder if I am a fearful optimist/hopeful cynic. And desperately miss my best friend. And enjoy running up and back down sand dunes! I can do a ridiculous amount of sit ups. I do not believe in justice...so stop holding your breath. I work at believing in grace, mercy, and that life never throws you more than you can handle. As a child, I never knew what I wanted to be when I grew up, and still don't. I miss the cicadas in Rockland. Without them, summer always feels like something is missing. I like the new James Bond, but not the films...Come on guys write better scripts! The reason I go to a Bond film is not to see him emotionally connect with a woman and be led astray. I don't want to connect with his softer side. (no pun intended) That's not what Bond is about. I think Starbucks' eggnog lattes are a little taste of Christmas heaven. I've been in love, twice in my life. And talked myself into believing I was, in one other relationship. I will take a bad cup of tea over a bad cup of coffee any day. I question those who have all the answers. I think all clowns are extremely creepy. I feel that the straight and narrow path may not be all it's cracked up to be...and that first step off, is a real doozie. Alright, the feeling has passed. That's all for now. My body has often been a barometer for what is going on in my life. Almost half way through my sophomore year in college, I experienced debilitating chronic joint pain in my hips. None of the Doctors could figure it out. I missed class, because it hurt too much to sit, let alone walk there and back. Walking back from the Art building I would call Peter in tears, begging him to please come pick me up in his car. The building was only a mile away from the dorms. I went for CT scans and MRIs which all came back normal. It was very frustrating business to suffer so, with no attributable cause to validate the pain. As quickly as it came, it left a mere 6 months latter. Looking back I can see how stuck I felt, and how much my life was moving in the wrong direction. Not until my situation changed, did my symptoms resolve. I have also experienced, thankfully not in many years,TMJ symptoms so severe that I could hardly open my mouth. The onset has always coincided with a situation where I felt completely unable to express my thoughts and feelings. And not so mysteriously lasts as long as I am in said situation. Another example is terrible wrist pain that I get from time to time. The doctors diagnosed it ten years ago as Carpal Tunnel Syndrome. I had/have all the symptoms of CTS, however it comes and goes, usually only staying a week or so at a time. It only occurs a few times a year and can effect either hand. So it is obviously NOT Carpel Tunnel. I figured out 5 years ago that it only kicked in when I felt unsupported and over extended. That is when it would start hurting and I would put on one of those oh so attractive wrist braces. My wrist would get the support it needed till it felt better and I would do some soul searching to find where I needed more support. With in the week, I would be as good as new. While this communication with my body is helpful and healthful for me, it helps further what I think is an ultimately misguided belief that my health and well being are in my control. I received the message growing up, that illness is an outward manifestation of dis ease in ones own life. While that belief empowers, it also fosters the illusion of control. There are things I can control, and I can make healthy choices, but still get sick for no reason. Not everything means something. Like dreams. Some dreams are like your brain just threw up the entire contents of the previous day, but others are important, and meaningful. Sometimes a cigar is just a cigar and a cold is just a cold! It's that time of year folks. All the catalogs, and advertisements are sure signs that the gift giving season is upon us. My children can't wait to look through all the catalogs and make lists of what they hope Santa will bring. The Toys R Us advertisement had some questionable items this year. I found this delightful item in a section that advertised traditional genderless games like Scrabble, Uno, and Life repackaged all pink and girlified. Does the manufacturer really think that girls are going to see these and think "Like oh my God! I never wanted to play Scrabble before but it looks so cute in that pink box. Now that it's pink I just have to have it!" 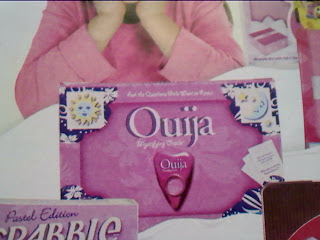 And what about the Ouija board. I thought the whole point of that was the creep out factor. Though the statement on the box...Ask the questions girls want to know creeps me out a little. Which dead female icon would they be getting said advice from anyway? 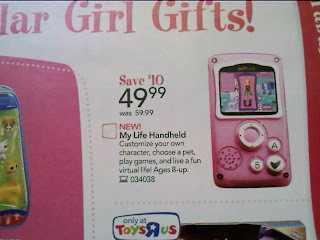 My Life Handheld "Customize your own character, choose a pet, play games, and live a fun virtual life!" Oh yea. I prefer to give gifts that promote a fun filled REAL life. But hey, that's just me. Personally I am hoping I get the Shamwow. I just love the as seen on TV infomercials. (Hint hint Dad) And those water globes are pretty, though practically speaking, you can just invert any soda bottle filled with water and stick it in a pot to achieve the same effect.